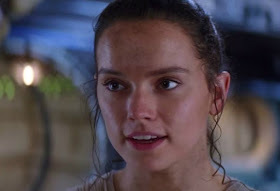 The Star Wars Underworld: Daisy Ridley Calls the Episode VIII Script "Very Good"
Daisy Ridley Calls the Episode VIII Script "Very Good"
We've still got over 500 days until Star Wars: Episode VIII hits theatres, however the film enters into production in January and Rey actress Daisy Ridley shared her thoughts on the script in a new interview with Variety. When asked if she had read the script yet, Ridley said, "I have. It’s very good; very good. Let’s see “VII” first and then we’ll talk about “VIII.” [Laughs.]" "It will be interesting to go back to “VIII” after everyone’s seen the film. I’m glad that people are going see the film before we start shooting because I think that will be a kind of… not a marker, but some kind of directional thing. I think it’ll be a very different experience." Just 523 days to go! Me too. I'm melting! I cannot wait. VII leaves us wanting VIII. A good thing indeed. "OK ready for Ep 8 now"
I'm with you all, I am so ready! So many questions, first of them being WHAT'S THE TITLE? !